New 2013 Seat Leon unveiled | What Car? This is the new Seat Leon that has been launched at the Paris motor show. It goes on sale in February 2013 and, for the first time, it will be available in a choice of body styles. This is the all-new Leon 5dr, which arrives first. Later in the year it'll be joined by sportier three-door and more practical 'lifestyle' estate versions. The five-door Leon's character has evolved subtly. The exterior has strong echoes of the current model, but there's a more sharp-edged look, with hints of the IBE concept car. As with the Ibiza, two 'character lines' run along the side of the car from the top of the front and rear lights, but they're much flatter and straighter on the Leon. The car pictured is an FR model, which has sportier bumpers than lesser models and distinctive LED details for the front and rear lights. All Leons get the same distinctively shaped door mirrors, however, and an unusually 'flush' rear end, with only a small recess between the bumper and tailgate. For the new Leon there are 'proper' rear door handles, too, rather than ones hidden in the door frame. Seat suggests the new model's more overtly practical look allows it to compete more squarely with its rivals. It also creates more space in the range for the three-door version, which will have a much sportier appearance. It'll take more styling cues from the IBE, with a lower roofline, wider front wings and a side window line not too dissimilar to that of the new Audi A3. It's expected to get a different name which, in line with the Ibiza range, could be SC. Similarly, the estate version is likely to be called ST. It'll have an emphasis on style rather than outright space, but will have more load space than the five-door model. Interior quality has taken a big step forward. We sat in a pre-production model that was missing some of the final car's polish, but it's clear that there's a significant upgrade in material quality. The dashboard top, in particular, has a satisfyingly dense, soft-touch feel similar to that in some Audis, and the overall ambience is no longer inferior to the Leons VW Group counterparts. The cabin is easy on the eye, too, with a mix of sweeping curves and sharp creases and a centre console angled towards the driver. Many of the controls are familiar from other VW Group models, but the uniquely shaped air vents and door pulls have an impressively bespoke look. One of the most impressive aspects of the interior is forward visibility. Unlike the current Leon, there are no extra front quarterlights and the windscreen wipers now sit at the foot of the windscreen rather than upright in the front pillars. The pillars themselves are unusually slim, too. There's plenty of space in the front seats and, partly thanks to a 5cm longer wheelbase, rear legroom is generous. Headroom is good, too, and the boot is well shaped, with a much larger entrance than the current car's. Underneath, the Leon uses the new VW Group 'MQB' platform, which is the basis for the new Audi A3 and next years all-new Skoda Octavia and VW Golf. The Leon will use a similar range of engines to those cars, too. 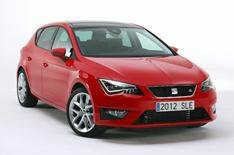 Seat has confirmed therell be 1.2 TSI petrol units, with either 85bhp or 104. There'll be two 1.4 TSI units a 121bhp version and a 138bhp unit with active cylinder management, which shuts down two of the cylinders when cruising to save fuel. A 178bhp 1.8 TSI model will top the petrol range from launch. The diesel options will be 89bhp or 104bhp 1.6 TDI units, or 2.0 TDI models with 148- or 181bhp. Fuel economy and CO2 emissions are yet to be confirmed, but Seat will continue to offer Ecomotive versions with a range of efficiency-boosting measures; the cleanest should emit around 95g/km of CO2 and average more than 75mpg. Six-speed manual and six- or seven-speed DSG semi-auto gearboxes will be available, depending on engine. There will be two suspension set-ups on the new Leon. Lesser models will get a simpler independent set-up, while sporty FR models and above will get a more sophisticated (and expensive) multi-link affair. A range of high-tech options will be available on the Leon for the first time, including sophisticated infotainment systems and advanced safety systems including drowsiness-alert and active headlight beam systems. There are three trim grades available - S, SE and FR. Prices start at 15,670 for a Leon 1.2 S, while the range-topping Leon 184 2.0 TDI FR costs from 22,375. There'll be some crossover with the recently announced Toledo hatchback, which arrives at roughly the same time as the Leon. Seat says the two cars will appeal to very different types of buyer, however, and the Toledo will be offered only with lower-powered engines.